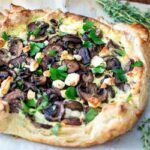 This mushroom tart with feta and thyme is so simple to make at home and keeps for up to 3 days. It is the perfect lunch item, or pack it ip and take it on a summer picnic. Plus being free-form you don’t need a pie tin and there is no chance of it sticking. 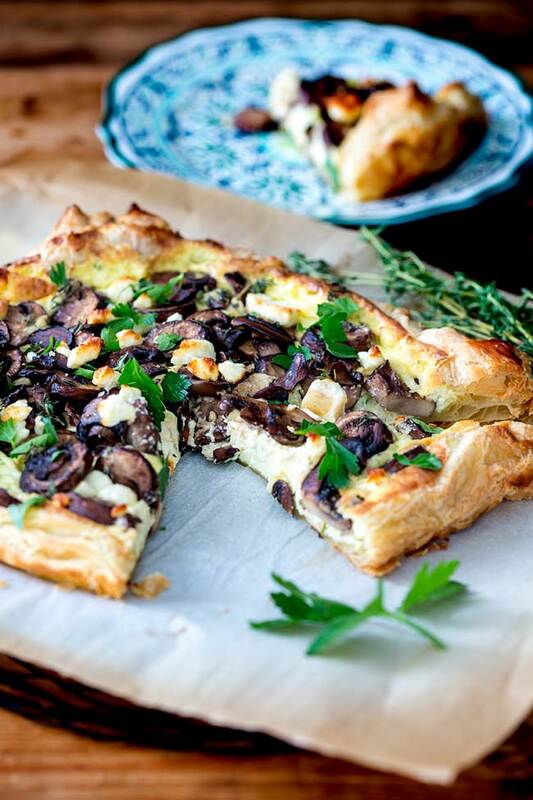 You won’t need a tart pan for this rustic mushroom tart. You can make this with just a sheet pan. First roll the pastry out slightly so you have a square. 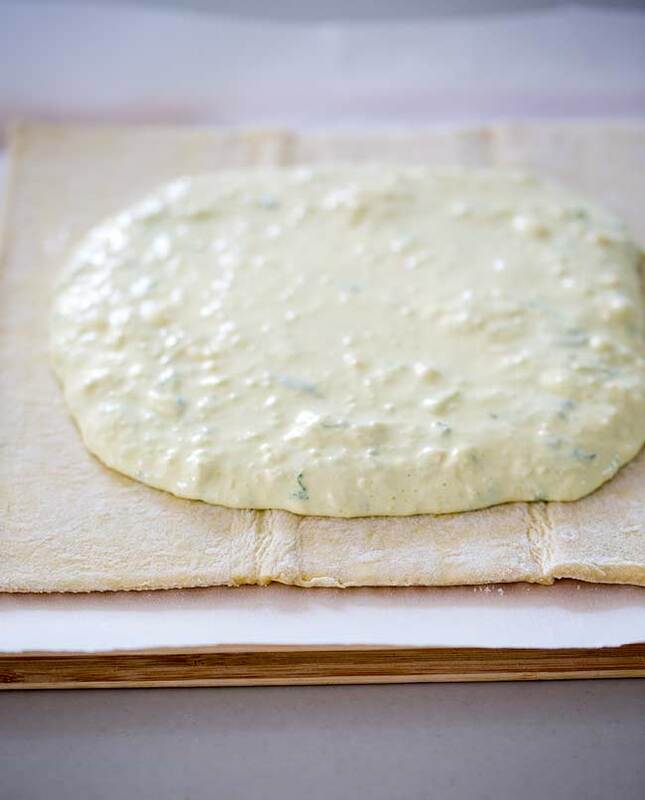 Make a thick filling that includes an egg, to ensure it doesn’t run off your pastry. Pile the pastry with the tart filling, leaving a 1.5 inch (4cm) gap around the edge. Pile the cooked mushrooms on top. Crumble over the feta and fresh thyme leaves. Then fold over the pastry edges. Bake the tarts in a hot oven so the egg in the filling sets quickly and the pastry crisps up. 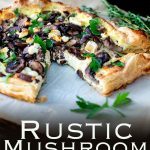 What to serve with this rustic mushroom tart. This tart is wonderful warm or at room temperature. I love it as a brunch with the girls….especially if there is a side order of Elderflower, Apple and Gin Fizz. Shake it all together in a small jar, or whisk together in a bowl. To make it more of a dinner you could add some potatoes, I’d suggest my hedgehog potatoes because EVERYONE loves them :D.
Need an easy vegetarian tart recipe? 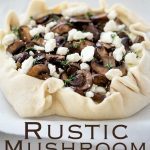 This Rustic Mushroom Tart with Feta and Thyme is what you are looking for! 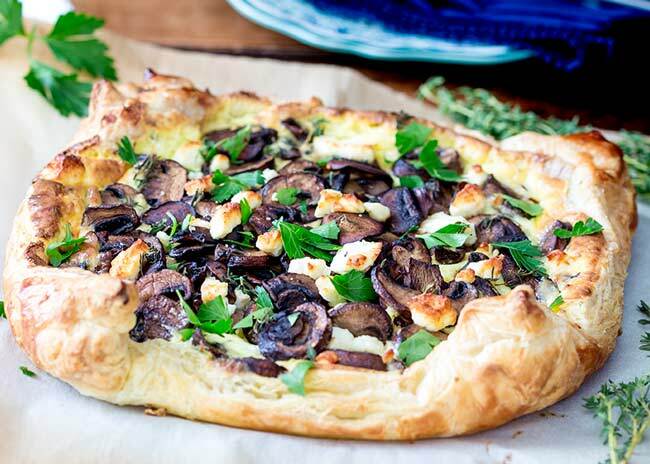 Packed with mushrooms and cheese and so simple to make! Preheat your oven to 400ºF/200ºC. Heat the butter and olive oil in a large fry pan, add in the mushrooms, a pinch of salt and pepper and the leaves from 4 of the thyme sprigs. Cook over a medium heat for 4-5 minutes until the mushrooms are golden and have released all of their water. Set the mushrooms aside to cool. Process the cream cheese, salad onion, minced garlic and eggs together until you have a smooth mixture. Line a sheet pan with greaseproof paper and place the pastry sheet onto the lined tray. Spread the cream cheese mixture over the pastry leaving a 1.5"/4cm border around the edge. 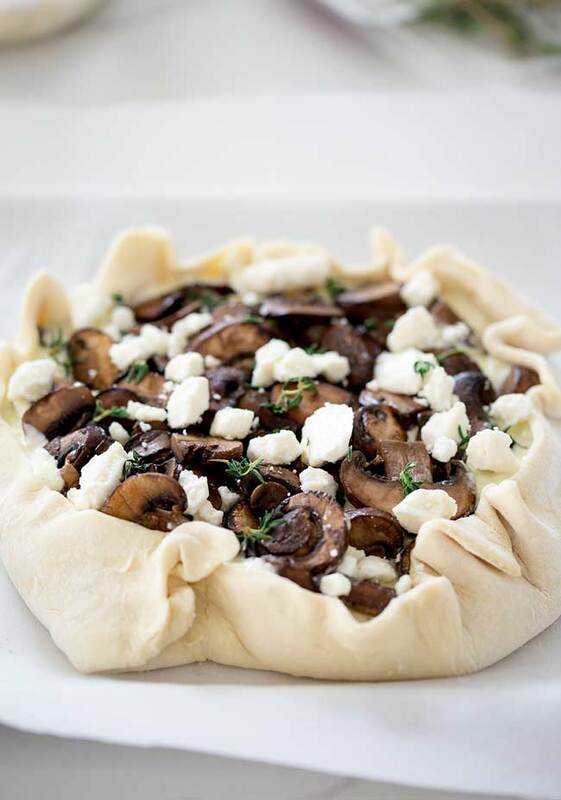 Top with the cooked mushrooms and then carefully fold up the pastry so to it slightly covering the edge of the filling. Crimp any extra bits together. Add the crumbled feta an the remaining thyme leaves. Brush the pastry with milk (or egg wash) and bake for 15-20 minutes or until the pastry has puffed up and is golden brown. The hotel used to have a free-form crab and wild celery tart on the lunch menu. It was, well word can’t describe it!!! It was just sublime. The filling was so perfect, but the beauty of the tart was the rustic looking case. So puffy and delicious, but so simple to make!!! Plus it makes it so much easier!! One less thing to wash-up (always important) and no chance of the tart sticking to the base. 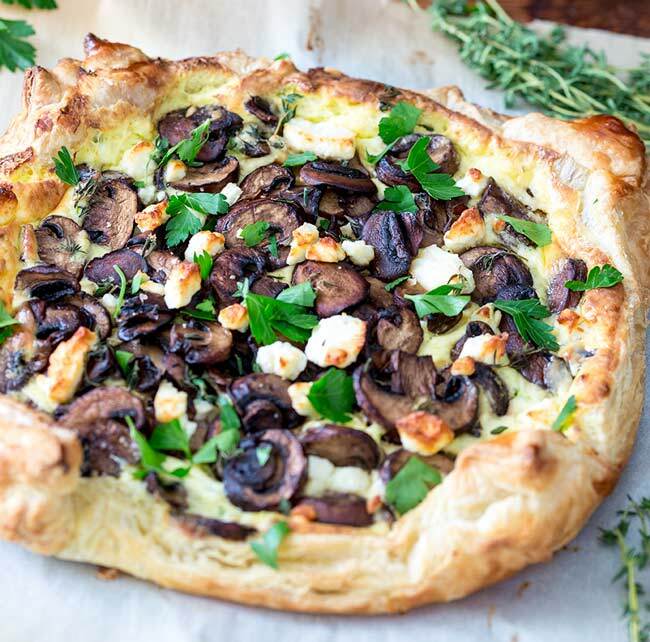 If you love food why not subscribe to my newsletter, I will drop you an email every now and then, just to say hi and send you a couple of recipes think you might love, like this Rustic Mushroom Tart with Feta and Thyme. This gorgeous tart looks so flavorful! Oooooh, now we are talking! I would love to come over for a girls day with this on the menu! My husband hates mushrooms so I would definitely need others to help me eat ita ll!